« per CMS: A joint replacement ranged from $5,300 at a hospital in Ada, Okla., to $223,000 at a hospital in Monterey Park, Calif. The use of gene regulation technology in research and medicine had evolved rapidly since the discovery of post transcriptional gene silencing using RNA interference (RNAi). RNAi was first described in C. elegance in the 90s of the previous century. RNAi post transcriptional gene regulation is carried out by small non-coding RNA double strand RNA (dsRNA) molecules such as microRNA (miRNA; miR) and small interference RNA (siRNA), and has an important role in defending cells against parasitic nucleotide sequences (e.g. viruses) as well as in gene expression regulation. In RNAi-mediated gene regulation, short dsRNA molecules are being transcribed in the nucleus (in the case of miRs) or introduced exogenously into the cell (in the case of synthetic siRNA or viruses), and are processed in the cytoplasm by an enzyme called Dicer that cleaves long dsRNA and pre-microRNA to produce short double-stranded RNA fragments of 21 base pairs long. The 21 nucleotides long double strand RNA is then being incorporated into the RNA-induced silencing complex (RISC) where it is unwound into two single strands RNA (ssRNA). The “guide” strand is then paired with its complementary targeted messenger RNA (mRNA) that is subsequently cleaved by Argonaute RISC-associated endonuclease. Consequently, the targeted gene protein expression is blocked, leading to its substantial reduced levels in the cell. This so called gene silencing or gene knockdown, hitting the message not the gene itself, will last as long as RNAi molecules are present. The mechanism of action of RNAi is illustrated in the following Video. RNAi technology was then massively adapted for research allowing the evaluation of functional involvement of genes in various cellular processes because introducing synthetic siRNA into cells can selectively suppress any specific gene of interest. Not only that RNAi serves as a valuable research tool both in cell culture and in vivo, RNAi has an extremely high potential for specific gene-targeting therapy, as many diseases consist gene deregulation. Synthetic siRNAs are perfectly and completely base pairing to a target (in contrast to endogenous miRs), leading to mRNA-induced cleavage in a single-specific manner that allows treatment without non-specific off-target side effects. All malignant conditions consist of gene deregulations in the form of mutations causing protein misfunction that lead to loss of cell growth regulation and consequently to cancer. Therefore, the fact that siRNA can selectively and specifically target any gene of interest creates a powerful tool to downregulate cancer-associated genes, that eventually will lead to a decrease and even abolishment of the malignant condition. RNAi technology represents a 3rd revolutionary step for pharmaceutics after small molecules and monoclonal antibodies (mAb), and has a strong commercial potential similar to mAb and even beyond. The ability to target any gene of interest, by blocking specifically the message from DNA to protein consequently the protein is not allowed to be expressed and thus is not functioning. Specificity – siRNA have strong potential to bind specifically to target mRNA, thus lowering unwanted side effects. siRNAs are double stranded oligonucleotides, which are resistant to nucleases. Choosing the gene of interest to be silenced – A wide spectrum of genes could be considered as targets based upon gene of interest role in the cancer cell, type of cancer, and condition of the disease: (i) Oncogenes or central signaling molecules that are crucial for cancer cell growth (ii) Anti-apoptotic deregulated genes (iii) Cancer metabolism associated genes (iv) Angiogenic related genes (v) Metastatic condition related genes. Considering the option of hitting combined target genes consist of different functions (e.g. an oncogene and an anti-apoptotic gene). Basic research evaluation – To examine the effect of silencing the gene of interest in cancer cell based assays and in animal models. Chemical modifications of the siRNA molecule – Modifications such as 2′OMe to increase protection from nuclease, decrease the immunogenicity, lower the incidence of off-target effects, and improve pharmacodynamics of the siRNA. Drug delivery formulation – For an efficient transport of the siRNA. Such delivery system could be formulated using liposome-based nanoparticles (NP) or other nanocarriers to facilitate the siRNA effective systemic distribution. PEGylation – PEGylation of the NPs carriers to reduce non-specific tissue interactions, increase serum stability and half life, and reduce immunogenicity of the siRNA molecule. Site specific targeting – Target tissue-specific distribution of the siRNA drug could be performed by attaching on the outer surface of the nanocarrier a ligand that will direct the siRNA drug to the tumor site. Preclinical – Efficiency and validity, as well as toxicity and pharmacokinetic studies for the siRNA-transporter formulation should be evaluated in animal models. Personalized treatment – In first stages clinical trials, biomarkers should be developed and detected to direct the selection criteria for further treatment of patients with the selected siRNA. Combined therapy – Conduct clinical trials using a combination of the siRNA drug together with a chemotherapy drug that is in-clinical use. Such combined therapy can result in synergism actions of the two combined drugs, and could lower the dosage and thus the side effects of the drugs. In addition, the use of established contemporary agents has practical industrial-related advantages as it is much easier to introduce a new mode of treatment on the background of an existing one. As mentioned above, an important aspect in applying siRNA-based therapy is the development of a suitable delivery method that should carry the siRNA molecule systemically to the site of the tumor. In addition, the siRNA-transporter formulation should provide protection from serum nucleases to the siRNA and should decrease its immunogenicity by blocking response of the innate immune system. Examples of such NPs are illustrated in Figure 1. Indeed, several clinical trials were conducted to evaluate the efficacy, validity, and safety use of such transporters for clinical use (Table I). The potential use of RNAi technology to treat cancer is versatile as for any gene of interest it is easy to synthesize a siRNA molecule and the pre-clinical development of siRNA agent is fast. Several companies specialized in siRNA technology have begun recently developing RNAi-based therapies to various cancer associated genes (as well as to other diseases) and to conduct clinical trials. 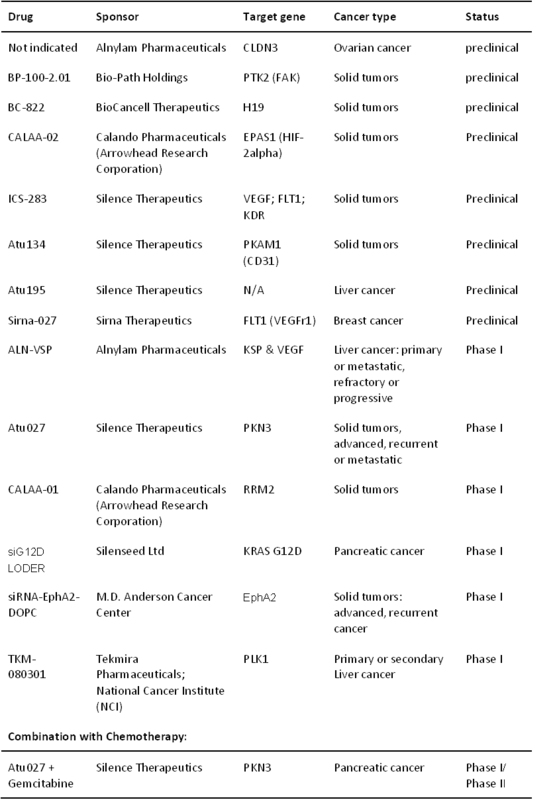 Table II summaries the current clinical trials status of such siRNA-based anti-cancer agents. The power of siRNA-based therapeutics resides in the ability to target and silence any desired gene. Pharmaceutical and biotech companies have started to conduct clinical trials of siRNA therapies for cancer. Most of these clinical trials are in the early preclinical and phase I stages. The results expected from these experiments should further direct the development of siRNA-based anti-cancer therapies and phase II and III trials should consequently emerge. Other target genes should be evaluated as well for siRNA-anti cancer therapy in addition to those that are currently in evaluation, and accelerated efforts should be made in the direction of combining existing chemotherapy with the technology of siRNA. The next future to come will tell us if the potential of siRNA therapy for cancer had been fulfilled. RNAi-Based Therapies for Cancer in Development. Anna Azvolinsky, PhD. Cancernetwork, March 3, 2011. Therapeutic Effect of RNAi Gene Silencing Effective in Cancer Treatment, Study Suggests. Sciencedaily, Feb. 11, 2013. Kinesin Spindle Protein SiRNA Slows Tumor Progression. Marra E, Palombo F, Ciliberto G, Aurisicchio L. J Cell Physiol. 2013 Jan;228(1):58-64. First-in-Humans Trial of an RNA Interference Therapeutic Targeting VEGF and KSP in Cancer Patients with Liver Involvement. Josep Tabernero et al. Cancer Discov. 2013 Apr;3(4):406-417. Chemical Modification of siRNAs for In Vivo Use. Behlke MA. Oligonucleotides. 2008 Dec; 18(4):305-19. Cancer siRNA therapy by tumor selective delivery with ligand-targeted sterically stabilized nanoparticle. Schiffelers RM et al. Nucleic Acids Res. 2004 Nov 1;32(19):e149. Therapeutic Nanoparticles for Drug Delivery in Cancer. Kwangjae Cho, Xu Wang, Shuming Nie, et al. Clin Cancer Res 2008;14:1310-1316. Liposomes and nanoparticles: nanosized vehicles for drug delivery in cancer. Malam Y, Loizidou M, Seifalian AM. Trends Pharmacol Sci. 2009 Nov; 30(11):592-9. Targeted Tumor-Penetrating siRNA Nanocomplexes for Credentialing the Ovarian Cancer Oncogene ID4. Reporter and Curator: Sudipta Saha, Ph.D. Thank you for this very well researched and very well written article. It is your best thus far and I am very pleased to note growth and progress in your presentation methods being in keeping with our standards and style, both are critical for the quality of e-Publishing we are committed to represent. 2. Let Dr. Barlyia include this article in our forthcoming e-Book on Nanotechnologies in Drug delivery, in a new Chapter in this eBook on Nanotechnology in Drug Discovery, which you would like to Edit yourself, this newly proposed Chapter inside the e-Book edited by Dr. Barliya. It is in analogy to Dr. Dror Nir, being the Author and Curator of four Chapters inside the e-Cancer e-Book, edited by Williams, Saxena and Barlyia. 5. Please consider the BIG opportunity that Katie needs be filled. She is our Business Partner, she will provide you training and will lead you toward a new challenge in your career. excellent article and great way of incorporating a downloadable table with links. This is a great strategy for posting and love the way you tell the reader to click to enlarge the figures and table. I definitely will incorporate that strategy in future posts. It is very nice to see the field developing into clinical trials so rapidly. You mention how time for development is reduced in using the siRNA strategy. Are there any regulatory hurdles that these companies are having in developing this new technology such as clinical trial recruitment, FDA submission, etc.? Indeed, as the blog is somewhat not friendly to table incorporation I had to find this creative way of presenting the data. The fast/reduced development time for siRNA therapy is indeed at the pre-clinical stage, as for any gene one could synthesize a siRNA molecule. I actually do not know what are the hurdles such companies having when coming to apply such technology in clinical trials/FDA issues. It can only be assumed that as for any new technology reached the stage of clinical trials, there are customary FDA regulations to be fulfilled. I presume that barriers from FDA side have been already overcome by now. One issue I could think of is delivery by viral carriers that could be an obstacle. 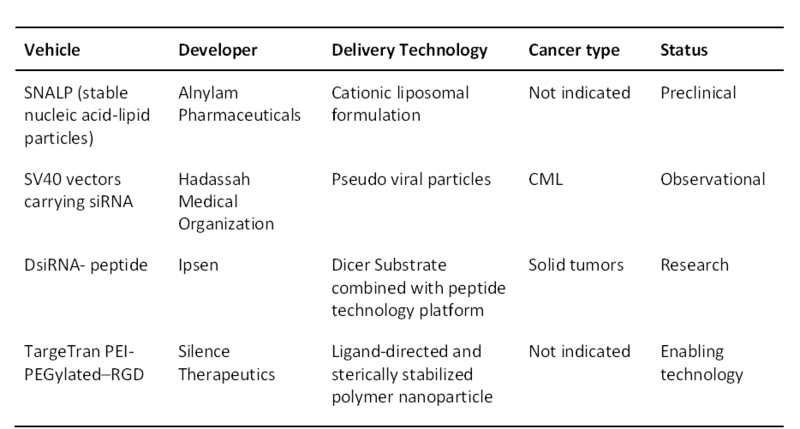 Indeed, most if not all the clinical trials depicted in Table II are with nano-particles carriers. Great reading, and really interesting use of the URLS.